An exhibiton of work by Nicole Niven. Monday 22nd June to Saturday 15th August. (Hons) in Fine Art Printmaking. I now live and work in Aberdeenshire. colours will change until the resin has been poured. This show chronicles the making of ‘mother’, my 1970’s set short film about a family torn apart by the wife/mothers suicide. The film focuses on the relationship between the father and daughter characters in the wake of the loss, and shows how in their grief the daughter falls into her mother’s place. In a bid to attain a period aesthetic using modern equipment we shot the film using prime lenses from the 70’s and used an adapter to attach them to a Sony HVRZ1 High Definition camera. This kit was provided by Dave Falconer of Falcon Audio Video (www.falconaudiovisual.co.uk). Dave also served as cinematographer on the project. Making this film was truly a collaborative experience with Richard Browne holding dual responsibilities of lighting and sound as well as taking some production photos. Caroline Smith produced the film as well as playing the mother character. My girlfriend Becky Wheeler came onboard as production assistant and photographer. In front of the camera Lindsay Cromar and Sarah Birtles also delivered as the father and daughter respectively. Tim Courtney, of the band Katerwaul, provided the films score. The film is still in post-production after which I will put it on the festival circuit and look to get it screened as widely as possible. For now I hope this show can act as a preview and as a glimpse into my filmmaking process. Please visit my blog at: www.shaun-hughes.blogspot.com for more information about this project and all aspects of my work. My name is Myriam Ceglarek and I am the photographer of this exhibition. These pieces are not yours. Art work by other people. 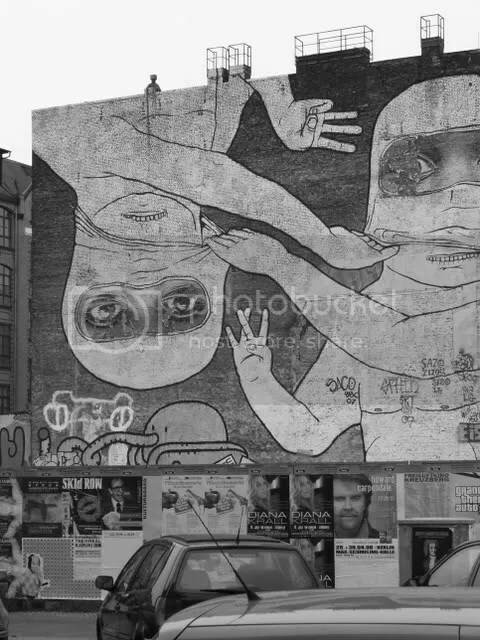 If you wanted to document Berlin street art as a photo journalist, I might suggest you think about your compositions and tonal range of the photographs. Maybe using photographic paper might help. A good black and white photograph should have a broad gradient from highlights to shadows. Most of these pieces look like photo copies. Is this on purpose? I also think the bulldog clip idea is a nice way to present the photographs opposed to the clip frames. I hope this has been of use to you Myriam. Of course I know that the stencil works, etc. are art works by other people. That was exactly the reason why I took photos of them. The photos are my photos of art works of other people. In the streets of Berlin. That is the reason for the title “Berlin Street Art”. And not “Myriam Street Art”. Not of much use unfortunately but I do appreciate your comment.